Description: NO MAGAZINE SALES into NEW YORK CITY. CONNECTICUT residents must furnish us a copy of your CT Eligibility Permit or ammunition certificate. This listing is for One Magazine; Buy 3 Ships Free: Combine any three of our accessories, and shipping is FREE for the entire order, lower 48. 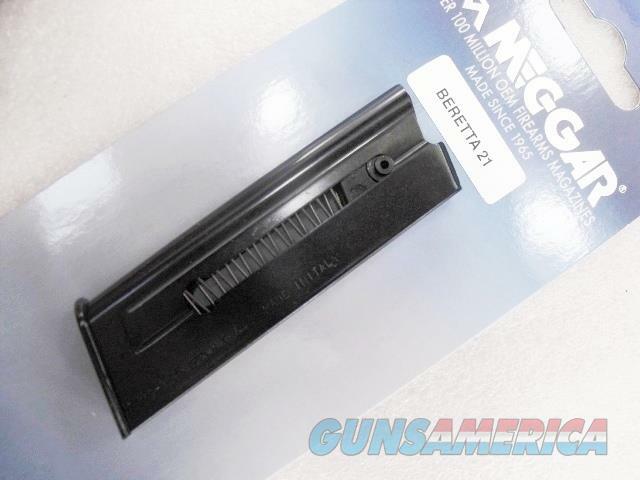 Here are top quality magazines to fit the model 21 Beretta double action tip-up pistol chambered for .22 Long Rifle ammunition. Manufacturer is Mec-Gar s.r.l., of Gussago, Italy, the principal factory magazine supplier for Beretta, Browning, Kel-Tec, Sig-Sauer, Smith & Wesson and others. Importer and warrantor is Mec-Gar USA of Meriden, CT. Construction is entirely steel: folded steel one piece body, with round count ports, and with full length tig-welded back that is smooth milled. Spring is music grade steel wire, with steel inner plate, floor plate, and cartridge follower. Each magazine holds 7 rounds of .22 Long Rifle caliber ammunition. These magazines will only fit the Beretta model 21 pistols that were manufactured from 1992 until 2013, and that were chambered in .22 Long Rifle caliber. That includes models 21, 21A, 21AW, and 21AW Lady Beretta. They will NOT fit a .25 Caliber Beretta, will NOT fit a 950 or Minx, will NOT fit the cigarette lighter plug of a 1952 Nash Rambler Station Wagon. They will only fit Beretta 21 series pistols chambered in .22 Long Rifle. Replacement pricing on a Beretta Factory Magazine is upwards of $50, and they aren't easy to find. Mec-Gar is as good as, or better than, a factory original magazine. Own one	for only	$ 18.00. Not for sale to residents of New York City. Any magazine deliveries into New York City require written permission from the Police Commissioner, so we cannot ship magazines into any of the five boroughs or 176 some odd zip codes, per NYC Code 10-131.10. Connecticut buyers must furnish us a copy of your State Issued Eligibility Permit or Ammunition Certificate, per P.A. 13-220. Any ammunition, firearms, or personnel showing in any of our photos are Not included.